The hotel's lobby and bar makes the most its industrial proportions. Riverview Suite has original beams and a peaking ceiling. In Singapore, where the past has often been sacrificed in favour of the future, Leigh-Ann Pow discovers a new boutique hotel that makes the most of its history. Singapore has long been celebrated for its frenetic pace and its pursuit of all that is new. It is what has made the small island nation such an economic and social success over the years. But this narrow focus on ‘the next’ above all else has also sometimes resulted in the wanton sacrifice of the touchstones of its fascinating history. But in recent years the focus has shifted and the government and developers are working to preserve what is left of the country’s historic buildings, including its celebrated shophouses. 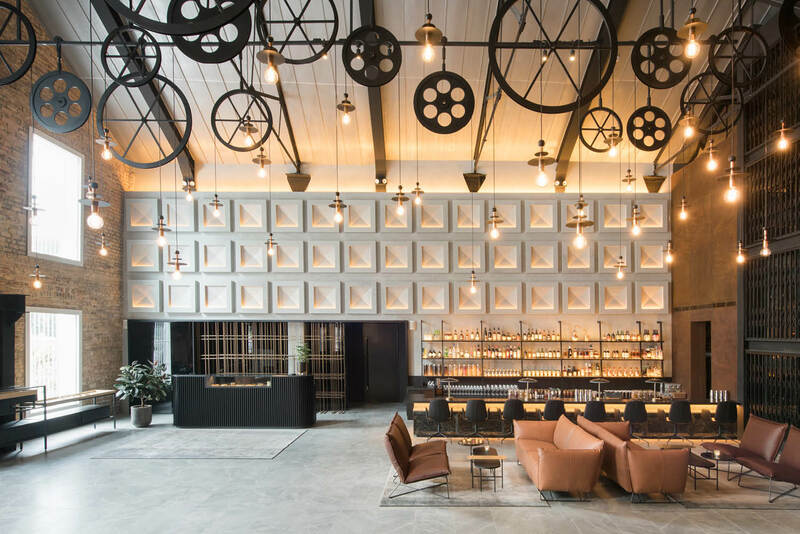 The Warehouse Hotel in the Robertson Quay area of the city is another example of a heritage building being repurposed and reimagined to stunning effect. Sitting on the very edge of the Singapore River, the former lifeblood of the city, the building dates to 1895, when Singapore was part of the bustling Straits of Malacca trade route. In the pursuing years, as trade slowed, the area became a magnet for secret societies, illegal liquor distilleries, prostitution and ne’er-do-wells busying themselves in all manner of lascivious dealings. 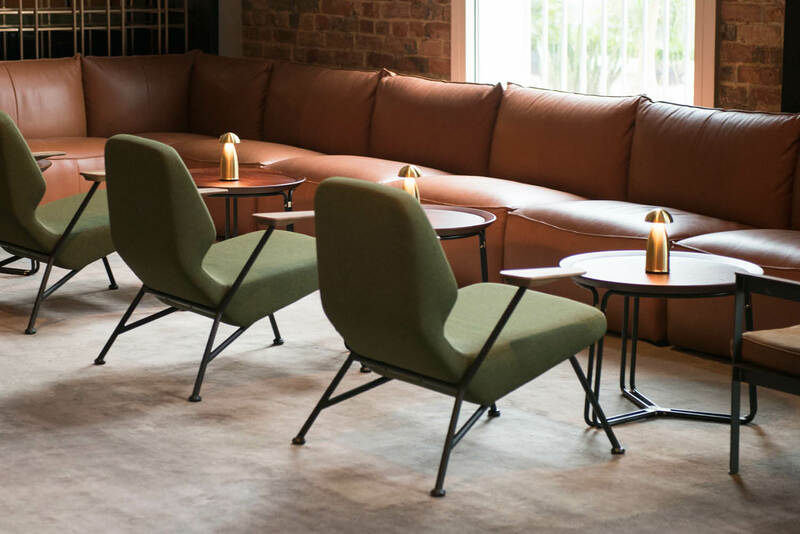 The recent restoration of the bonded warehouse has resulted in a 37-room boutique hotel that manages to be ultra-modern while still paying the utmost respect to the bones of the building. In a city where new buildings are stretching ever skywards, there have been no gratuitous add-ons here, no extra floors crammed in to maximise profits. The whole thing presents as if the hotel has been slotted into the existing building without ever coming into contact with the original. This respect for the scale and layout of the structure is evident as soon as you walk into the expansive lobby, a cool space that makes perfect use of the lofty pitched ceilings. On the left there is an unassuming reception desk, all sleek lines and clear purpose, manned by a young staff in meticulously minimal uniforms. Guests are invited to sit a while in leather couches that almost hug you as you sink into them. An icy welcome drink of hibiscus cordial and ginger is delivered from the sunken lobby bar in the opposite corner. Overhead design-conscious pendant lighting mixes with a cluster of industrial wheels and pulleys to form a hanging art installation. There are a few rooms off the lobby, which transforms into a schmoozy, low-lit bar for locals and guests after dark, but the bulk of the rooms are up a wide metal staircase that hugs the brick wall to the right of the space. These have a similar colour palette as downstairs, subdued neutrals and tones of grey, as well as benefiting space-wise from equally lofty ceilings. All the usual elements that make up a room are exposed here, becoming part of the décor instead of blending into it: the wardrobe is an open rail with shelving underneath, the bathroom is visible through large wrought iron and glass windows, with the toilet and huge shower behind frosted glass doors within. There is a smattering of furniture, all of which has a retro mid-20th century feel to it, and an enormous pillow-top bed swathed in fluffy down pillows and crisp white linens. The mini bar is well stocked with locally curated products, including the cheeky option of having adult toys delivered to your room, but it is the complimentary tea and coffee making facilities that stamp the design credentials of the property above all else: the tea is by local specialty tea company A.muse Project, while the coffee is a seriously strong and wonderfully intricate filter bag proposition that transforms the making of a morning brew into high art. The kettle plays its part too; it is a Japanese designer number that I have spent months prowling the internet in pursuit of; I can only find the stove-top version not the electric one used here. Each of the rooms is a variation on the theme, some with river views, some with views out to the local neighbourhood; the River View Mezzanine is one of the largest available, spread over two levels and complete with its own library space. All have access to the infinity pool that is attached to the side of the property, one of the few retro-fitted features added to the existing footprint. The pool’s glass sides provide quite the view for the motorists whizzing by on the busy roads that it overlooks. 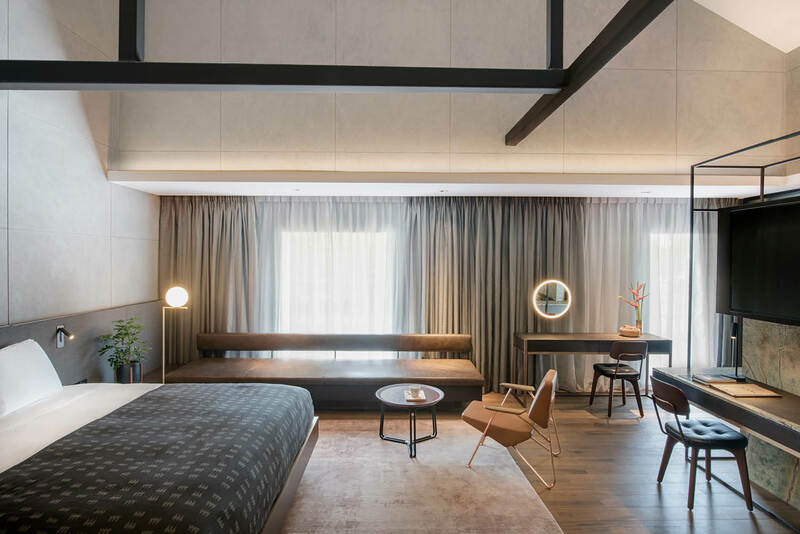 The Warehouse Hotel, a member of the Design Hotels collective, was realised by the Lo & Behold Group, a local company with a roster of modern designer restaurants and bars, and a beach club, to its name. So, it’s fitting that the on-site restaurant, Po, is a destination dining experience in its own right. Guests can make use of it for breakfast, lunch and dinner, rubbing shoulders with locals who come for chef Willin Low’s Mod-Sin menu of reinterpreted nostalgic comfort food (Po stands for popo, grandmother in Mandarin) like veal cheek rendang and seafood congee. Guests can always venture into the surrounding neighbourhood, an ex-pat enclave with plenty of dining options at Robertson Quay, and the slightly more touristy Clarke Quay a 20-minute walk away along the river, but at the end of the day, returning to the gently lit lobby and another one of those delicious hibiscus cordials encapsulates the irresistible old-meets-new allure of this ever-evolving city. 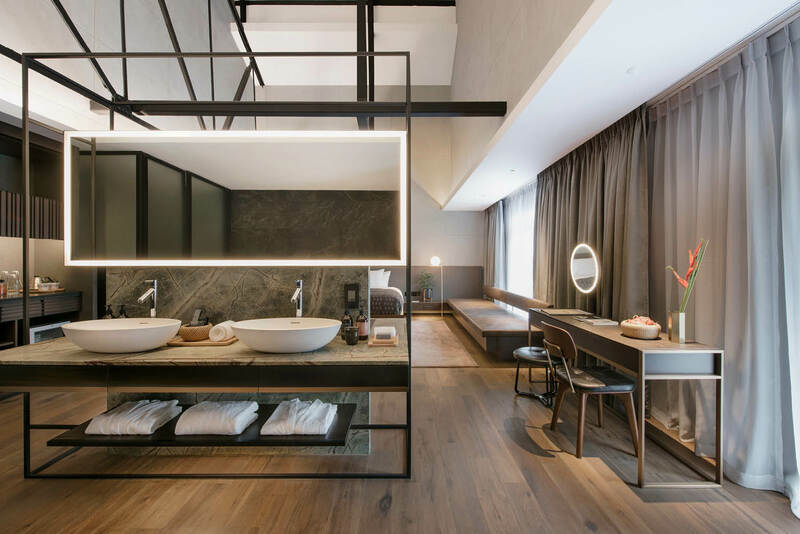 Another recent addition to the roster of boutique hotels in Singapore, Hotel Mono, pictured left, occupies a row of old shophouses in the Chinatown neighbourhood. For anyone who has a healthy respect for the power of a black and white palette, this place is a gem: it adheres to a strict monotone aesthetic throughout, from the furniture to the umbrellas in the lobby to the bathrooms in each of the compact rooms. While space is at a premium throughout, each of the 46 rooms has everything needed for a comfortable stay, including fast wi-fi, soft beds and communal areas with space to relax. Outside, Chinatown has the kind of dining, shopping and drinking options that characterise the city.